Custom Cut Glass can put the perfect edge on your piece of glass. Whether you need standard or specialty edge-work on your glass, you can be assured that each edge will be precision machined on our state of the art edging machine. Just let us know if your project requires a special edge and we’ll give it a great, customized look with our quality edge-work. If not, we’ll still make sure you always get pieces with edges that are sanded and safe to handle. Specialty Edge-work removes any uneven appearance on the edge of the glass after it has been cut. Another benefit of specialty edge-work is the enhanced the appearance of the glass, this is true whether you chose standard edge-work or specialized edge-work. Specialized edge-work gives the glass a great appearance. Standard edge-work is our standard finish and is included at no extra charge on all pieces. We call this the seamed edge. 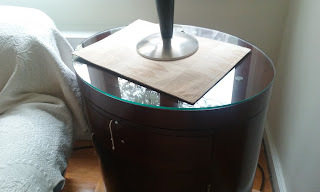 This is perfect for items that will be installed so that the edges of the glass will not be seen, these edges are sanded smooth so the glass is safe to handle but it is not necessarily decorative. Our standard edge-work will follow industry standard tolerances. Specialty Edge-work options can be added to any pieces or shapes for an extra charge. Use the Instant Online Quote feature above to quickly estimate the cost for your specific project. Pencil Edge: This type of edgework results in an edge that is slightly rounded. Pencil Grind edgework has a frosty, matte, or satin finish. Pencil Polish edgework provides a glossy, shiny finish; perfect for a style when you are wanting to create an extra pop! Flat Edge: This type of edgework results in an edge that is Flat with small chamfers on the corners. Flat Grind edgework has a matte, frosty or satin finish. Flat Polish edgework provides a shiny or glossy finish. 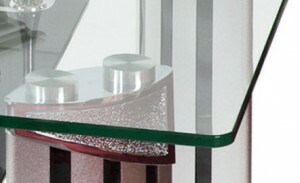 Bevel Edge: This type of edgework adds a sense of depth on the glass. This is often used for an ornate application. Bevel Edges have a shiny or glossy finish.